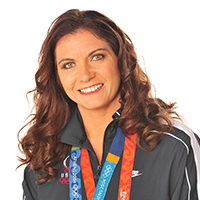 At 109 career wins, professional volleyball player and three-time Olympic Gold Medalist, Misty May-Treanor, has more career wins than any other female volleyball player in history. With teammate Kerri Walsh, Misty earned gold medals at the Summer Olympics in Athens (2004), Beijing (2008), and London (2012). Misty has dominated every level of the sport of volleyball, both as an indoor volleyball Champion (two high school State Championships at Newport Harbor High School, 1991-1995 and one NCAA Div 1 Championship at Long Beach State, 1998) and as the greatest beach volleyball player in the history of the game. Above and beyond Misty’s achievements in her sport, she takes great personal pride in making a difference and impact in the lives of others less fortunate. Misty spreads goodwill through her work with Special Olympics and the Make-A-Wish Foundation, as well as many other causes and initiatives important to her. Misty has created M2 Volleyball Camps & Clinics in an effort to teach young athletes and coaches the proper skills and techniques to be the best athletes/coaches they can be. Incorporated into M2 Volleyball Camps & Clinics are important education components such as motivational techniques, life skills, recruiting information, and more. Looking back, it’s no surprise that this Los Angeles native became a professional athlete. Misty grew up playing beach volleyball at the Santa Monica Pier with her parents, 1968 volleyball Olympian Butch May and Barbara May, a nationally-ranked tennis player. In her adult life, Misty married Major League Baseball catcher Matt Treanor (currently playing for the Los Angeles Dodgers) in 2004 and competed on season 7 of Dancing with the Stars in 2008.